Well it’s that time of year again, the annual meeting of tomorrow’s best tech all in the fabulous setting of Sin City: The Consumer Electronics Show. 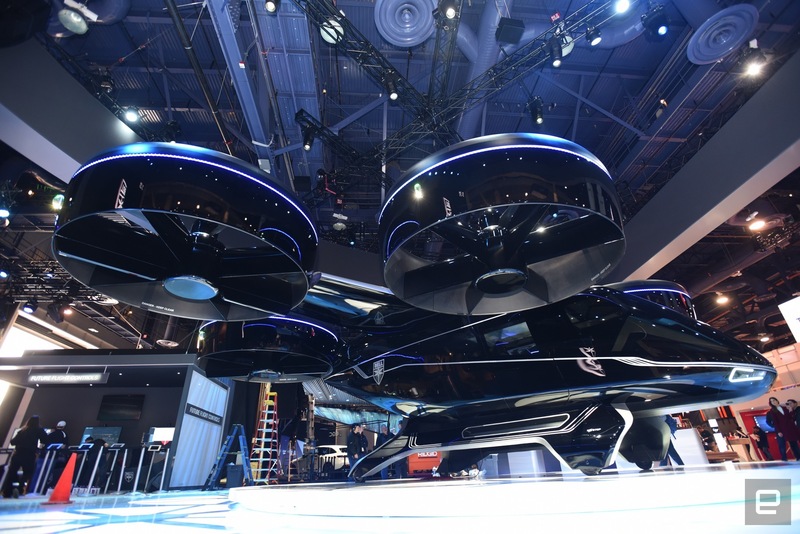 We always get really excited about CES because its a chance to see where technological innovation is set to move over the next couple years. It’s also just a really a good opportunity to nerd out over some gadgets. We’ve sifted through a treasure trove of cool tech and selected 10 of our favorite gizmos and gadgets that stood out from the rest. So without further ado, here is our top 10 list from CES 2019 (in no particular order of coolness). Rollable televisions have been featured at CES for a couple years now, but never as a consumer-ready product like LG introduced earlier this month. This beautiful set was a head turner to say the least. Extremely crisp picture and a robust color gamut all rolled up into a sleek modern rectangle that is sure to tie together even the most luxurious of living rooms. 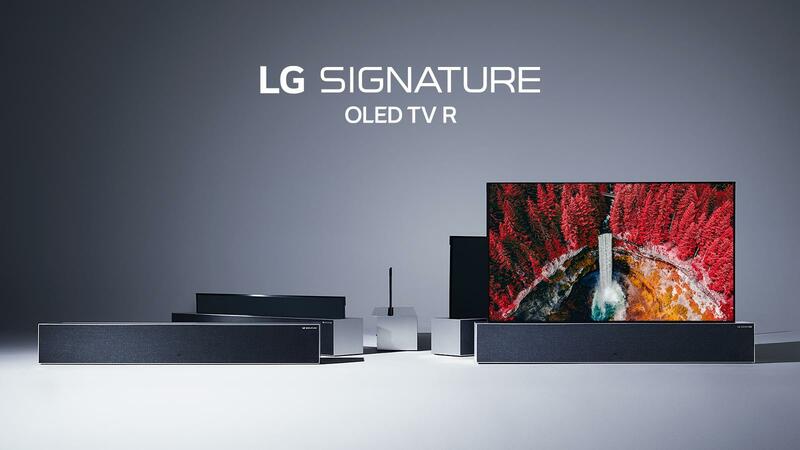 As if the sleek design and eye popping picture wasn’t enough, the model also comes equipped with a 100-watt Dolby Atmos soundbar which is a big upgrade from your typical factory TV speaker. The display is also equipped with your standard smart features we’ve come to expect in any modern television: Voice command, wifi connectivity, a full range of popular apps, and somewhat surprisingly support for Apple AirPlay 2. It’s almost impossible to put this tv into words, but if you want to see it in action click here. No price point has been officially announced yet but experts are saying you’ll be lucky to get one of these in your living room for under $10,000. If that price tag doesn’t scare you, LG says you can start looking for this display on store shelves around Q2 of this year. Fitness tech at past CES events has been notoriously hit or miss. Sometimes we get great new tech that makes sports safer, people healthier, and expands accessibility…and sometimes we get things like the iFit dance routine. Luckily, JAXJOX provided CES patrons with the former. For those unfamiliar with kettlebells, they are a wonderful fitness tool that really excel in improving mobility and core strength. However, much like barbells, a full set of them can take a lot of space in a gym. JAXJOX looks to address this issue by creating a selectable weight design that combines an entire set of kettlebells into one sleek device. The electronic interface changes the weight automatically from 12 to 42 lbs, and comes equipped with a slew of cool features. Gyroscopes in the base count reps, sets, and track workout times. It also comes with bluetooth connectivity and pairs with the JaxJox app so you can compete with friends and family and track your workouts. It also touts an impressive 14 day battery life and charges in just a couple hours. Since it just released this month, reviews on the product’s durability over time and with heavy use have yet to be written. But if that doesn’t worry you, its available online now for the formidable price tag of $349. One of the more surprisingly unique yet incredibly useful items at Samsung’s booth was their Space Monitor. The idea behind the design is so simple yet so innovative: A monitor that clips to the end of your desk to make room on your desk. It’s genius. 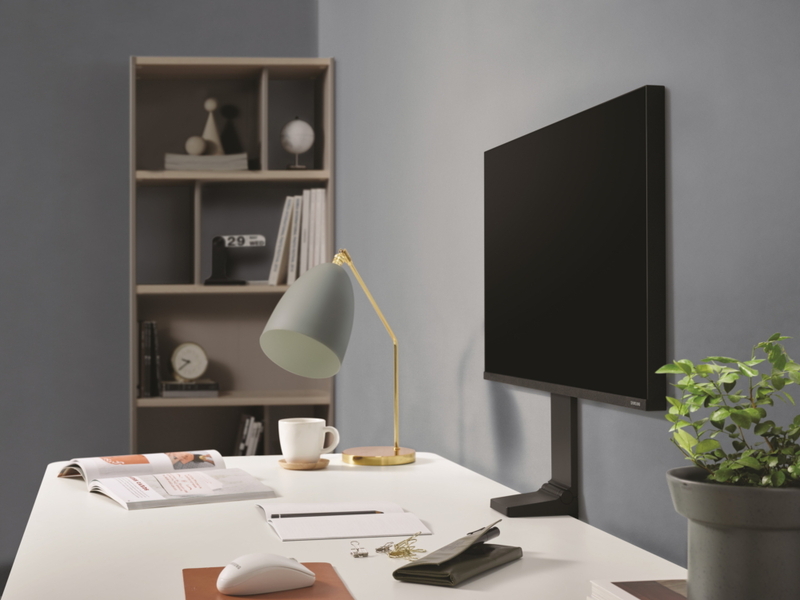 Sporting a sleek design and all the specs you’d expect from a Samsung quality display, this monitor was a hit on the showroom floor. The hinge on the back allows you to bring the monitor to desk level if you need to take a closer look at something or are reading lengthy reports. Cords are also hidden and tucked away in the hinge arm for a very clean look that is sure to please anyone with mild to severe cord-phobia. The monitor has standard 4k resolution, PBP (picture-by-picture), 60hz refresh rate, and comes in a 27” or 32” screen size. Pre-orders are available now for $399 and $499 for the respective screen sizes. There is always one piece of accessibility tech that really surprises attendees, and this year Samsung took that award home with their innovative exoskeleton dubbed GEMS-H. Luckily they put a lot more thought into the actual product than they did the name. Perhaps the most surprising feature about these robotics-assisted legs is how lightweight they are. Samsung had 3 different prototypes on display, each one more minimal than the last. The purpose of these devices are two fold. The legs can assist the user in walking and save up to 23% of the energy required to walk normally while also increasing pace by up to 20%. This is great for the elderly or those with serious injuries that need mobility assistance . On the other end of the spectrum, they can also provide resistance training and actually require the user to expend more energy than normal while walking. This particular feature is wonderful for those undergoing physical therapy that want to rehabilitate passively while performing normal tasks. Samsung was adamant that these are in very early stages of prototyping and wouldn’t even confirm if they ever plan on selling them to consumers, so it will be quite some time before we’ll see grandma at the grocery store sporting these…but anything is possible. 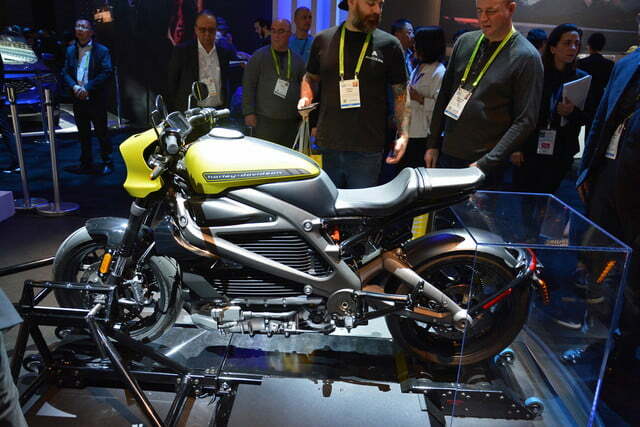 With the meteoric success of Tesla and a wave of fully electric vehicles hitting the market in the past few years, it was only a matter of time before America’s most iconic motorcycle got a green makeover. The all electric bike is capable of going 0-60 in a mere 3.5 seconds, and the automatic transmission means no clutch to mess with. They have not released full details regarding engine specs, but Harley claims the bike will have up to 110 miles of range. The aluminum frame keeps the weight at a minimum while the low mounted engine keeps it’s center of gravity low and stable. The lithium-ion battery is housed in a beautiful cast-aluminum case with fins on the outside that assist with cooling. Unlike most Harley designs, this particular model was developed with the urban rider in mind, as opposed to highway touring that most people associate with the Harley lifestyle. It also sports a beautiful 4.2 inch color touchscreen that comes with a variety of apps and can even find the nearest charging station for a quick recharge. While a very risky move for Harley, the company is confident it will help them increase their market share and bring an entirely new rider into their iconic brand. If you’re looking to get one, sales in North America and Europe begin in Q3 of this year starting at a steep $30,000 for the base model. 2019 is the year we finally see WiSA take off. For those that don’t know, WiSA is simply a protocol that wirelessly transmits audio signals in full surround, making messy wires for a home theater systems obsolete. The technology has actually been around for a few years now, but only a few manufacturers could utilize it for their speaker systems. Now, WiSA is brand agnostic and can offer lag-free crystal clear audio to any speaker system formatted for it. 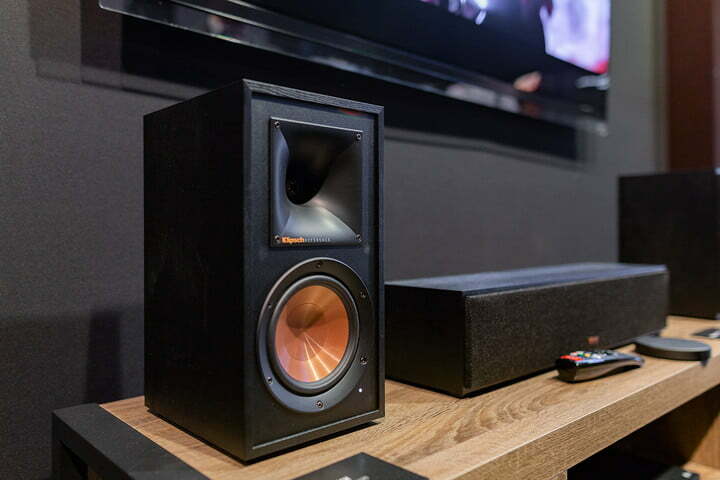 Klipsch took full advantage of this new wave of sound and displayed a beautiful, crisp, and very impressive home theater system to onlooking attendees. The system is comprised of 3 speakers: the RW-34c center channel, RW-51m monitors, and the stout RW-100sw subwoofer. The speakers are all powered internally and only need a power source to work with a WiSA transmission device. When paired together these bad boys can deliver dolby atmos 5.1 and 7.1 channel surround sound. The speakers showcase some crispy treble at high ends and beefy low end booms with the gorgeous subwoofer. Without wires these wood grain with brass highlighted cones look almost as great as they sound, and are sure to tie together any theater room with a classy and elegant appearance. Performance and aesthetic as clean as these won’t come cheap though. The speakers are available for purchase now but depending on your setup you’ll be hard pressed to get a complete surround system for less than $2,500, as the center channel alone is marked at $699. Gaming monitors typically aren’t a focal point of CES but the Samsung CRG9 dazzled attendees with an absurdly wide curved screen that was just too pretty to ignore. This ultra fast screen sports a 32:9 aspect ratio on a 5120×1440 resolution display, and the 4ms response time and 120hz refresh rate make this an esports worthy investment for serious gamers. It comes equipped with HDR10 support, 1 HDMI port, a USB port, and 2 display ports. The base is somewhat wider than most, which is to be expected with a screen this size, but it does a great job of preventing wobble and the unit itself is very sturdy. The curved screen means the picture remains crisp and bright at a wide range of viewing angles. Casual gamers are unlikely to be willing to shell out $1,499 for a monitor, but for those with deep pockets or aspirations of Rainbow Six Pro League, this might be the monitor for you. Uber has become a part of everyday life in every urban hub across the United States. They’ve invested obscene amounts of money into automated cars in order to rid themselves of their workforce, but it seems they have a plan to shift that force from drivers to pilots. The Bell Nexus borrows its design from the military’s Osprey, which is sort of like a helicopter/plane hybrid. It’s no coincidence that the team behind the V-22 Osprey and V-280 Valor are responsible for the engineering and design of this impressive air taxi. The cockpit looks like something straight out of Minority Report, with large touchscreens and slick lighting accents that are both beautiful and functional. The aircraft holds 4 passengers and 1 pilot, and is set to be 100% electric on launch. As with any aircraft, its built with highly redundant features so that its able to still land and fly if a prop goes down or there is electrical failure. Uber has rolled out an aggressive timetable for its debut, stating they intend to begin test flights by 2023. At top end speeds of 150 mph, it’s unclear how the government will regulate these flying vehicles and vet pilots for consumer safety, but Uber had similar growing pains when they first rolled out their app. Uber certainly has their work cut out for them if they hope to get these in major cities in the next 4 years, but the idea has some legs and if they’re able to pull it off could forever change travel as we know it. Now that 4k is basically standard for new displays, it was only a matter of time before 8k started to gain more traction. While there is very little 8k content even available, that didn’t stop Samsung from showing off what little footage they have on their gorgeous new 98 inch QLED TV. At more than 8 feet across, this massive display is impressive to say the least. The 8k display has four times the resolution of standard 4k sets, which may sound like overkill but it’s crucial for larger displays to maintain the same sort of image quality that the smaller televisions provide. The really neat feature on this particular series is Samsung’s proprietary A.I. technology that upscales any content to near 8k quality. This feature is active for streaming, watching movies on dvd or blu ray, and even mobile screen mirroring. It also comes equipped with AirPlay2 for the Apple junkies. This Q900 series will available later this year in a variety of sizes: 62, 75, 82, 85, and the 98 inch model pictured above. The 85 inch model has a hefty sticker of $15,000, and they haven’t even released a price for the behemoth 98 inch model. But for those looking for the ultimate home theater in dazzling 8k, you should be able to get it for about $30,000 later this year. NordicTrack has set out to prove that video games and exercise can go hand in hand. Enter the VR Bike. Part exercise equipment, part virtual reality experience, the NordicTrack Bike is not your typical stationary bike. The two handles tilt left or right and come equipped with buttons and two joysticks. The center display shows things like calories burned, incline/decline, resistance, miles/km, and time for when the user isn’t wearing the VR set. HTC’s Vive Focus is the separate VR piece required to play through the games that NordicTrack has had developed specifically for this equipment. For their demo at CES they used a game called Aeronauts, where user power a sort of zeppelin through rings in a beautiful world and shoot down balloons while avoiding obstacles and trying not to crash. The user must ascend and descend, speed up and slow down, in order to effectively navigate the environment, making for a robust workout. User beware however, as with most VR games some users experienced nausea and headaches. But if you’re one of those people with an iron stomach and don’t have a propensity for motion sickness , this new way to exercise might be just the thing you need to start your New Year’s resolution with a bang. The Bike and HTC Vive are sold as a package for $2,000, and will available online later this summer.